If you are interested in helping with general maintenance and small improvement projects at the Historic Grammar School, please email Tim Murphy at Tim@sccbf.org to be added to the contact list. General Board Meetings are held the 3rd Tuesdayof each month at the Native Sons Hall in Sutter Creek at 7pm. As our second year draws to a close, we'd like to share with you what we've accomplished these past months as well as some of the exciting things we are looking forward to. Our website is fully up and running thanks to member Bob Greene. With the help of Foundation members Claire Gusselman and Liz Tone our Facebook page has been updated. The final plans for the South Main Park and Gold Mining Display have been completed and have been submitted to the City for approval. We had an information booth and raffle at the annual Sutter Creek Chili Cook-Off. We are continuing to gather alumni contact information for the future Sutter Creek Grammar School Alumni Party. Look for our float at the Sutter Creek Light Parade on December 13th, 2014. Join us at the 4th annual Mardi Gras. 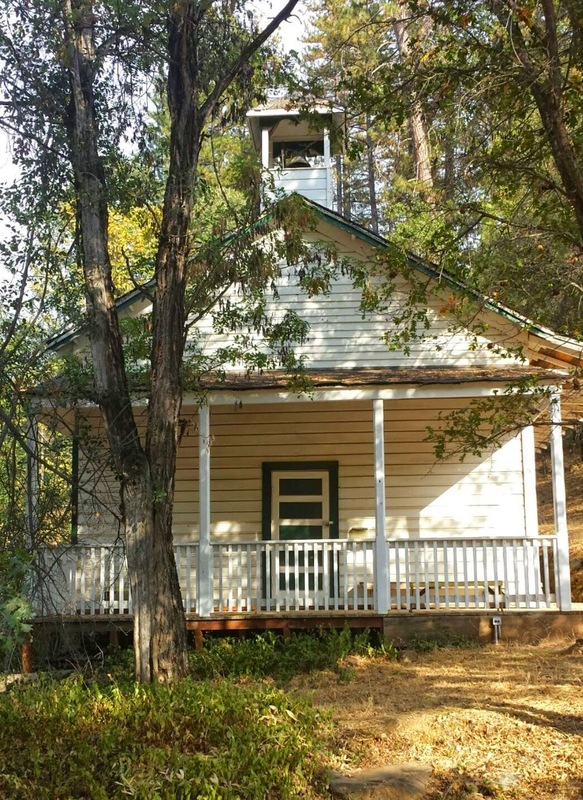 Our main project at this time is the restoration of the Historic Sutter Creek Grammar School. A hugely successful yard sale was held September 20th, with all proceeds going towards the restoration. Items that were left from the sale have been donated to Operation Care, Veterans Victory Village and Interfaith Thrift Store. A committee has been appointed by the City Council to access the condition of the building. Overall the building is structurally in good condition. Clean up and demolition has already begun, with removal of the stairs in front of the building and the stairway leading to the second floor. A request for bids has been sent out for replacement of the stairs and repairs to the bell tower. Next on our agenda will the repairing and replacing of windows, addressing the heating and air condition systems, bathroom remodel, exterior and interior painting and refinishing the floors. Our biggest challenge for this project will be raising the estimated $200,000 that is needed for the restoration. Community and member support has been generous but there is still much to be done. We are presently working out the details for the Historic Grammar School Capitol Campaign Kick Off in early 2015 and will keep you informed as plans move forward. If you or someone you know would like to help with the Capital Campaign, work on the grammar school restoration or any of our other projects, we could sure use your help! Please contact either myself at 209-304-9192 or any of the other board members listed on our website. Your enthusiasm for the creation of the Sutter Creek Community Benefit Foundation and its goal for preserving our history have been both inspiring and rewarding. Together we will make a difference. Did you know that approximately 235 children were born on Nickerson Street between 1938 and 1953? Betty Wiley's Maternity Home was located in the four bedroom home at 16 Nickerson Street. Ms. Wiley was a midwife who was the primary caregiver for her patients. A doctor would come to help with each delivery. One bedroom in the house was the birthing room, then baby would split time between the kitchen and mom, who would sleep in the other front bedroom. Mom and baby would stay for 2 weeks after giving birth. During those years Ms. Wiley was very proud of her record of never losing a mother. The Amador County Hospital opened in 1953 the same year that Betty Wiley's Maternity Home hosted it's last baby. Legend has it that one of our Board Members, Louis Boitano was the last child born in the house. This information was provided by Alan Bierce, a resident of Sutter Creek, husband of another Board Member, Helen Bierce and also one of the 235 children born at Betty Wiley's Maternity Home. If you were also born here or know more information about the Maternity Home please contact Alan Bierce at alanhelen82@gmail.com. In order to ensure the long term viability of Historic Sutter Creek and our Organization's mission, a well funded endowment is ultimately necessary. A financial endowment is a donation of money orproperty to a not-for-profit organization for the ongoing support of that organization.An endowment is structured so that the principal amount is kept intact while the investment income is available for use, which allows for the donation to have an impact over a longer period than if it were spent all at once. An endowment also has stipulations regarding its usage. Planning now to make a gift after you are gone is a wonderful way to preserve Sutter Creek and create positive change beyond your lifetime. By endowing your gifts today, you can make a difference in your community during your lifetime and provide a gift that lasts forever. If you would like to learn about the terms of our endowment please feel to contact Robert Gordon. We are also happy to structure an endowment that fits your own personal goals. Preston Castle Foundation’s Quest for the Deed is over! IONE, CA: Quest for the Deed? The Deed is Done! The Preston Castle Foundation is pleased and proud to announce that they have received the Deed to the Preston Castle and surrounding property, totaling almost 13 acres with 5 freestanding buildings. This has been the major focus of the Foundation’s fund raising and preservation and rehabilitation efforts over the past several years. 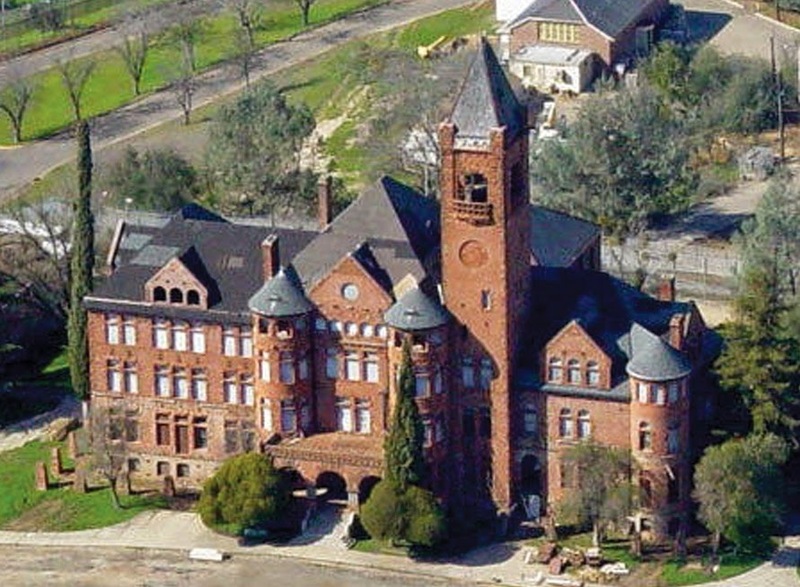 The strikingly beautiful Romanesque style Preston Castle, on a hill in Ione, was actually the administration building for the Preston School of Industry, the first major attempt in California at rehabilitating, instead of just impris­­­oning, young offenders. Opened in 1894, the Preston School of Industry became a leader in the juvenile prison reform movement by giving convicted boys a real chance at life by educating them not only in academics, but in all of the useful trades of the time. Closed in 1960, when the Preston Youth Authority moved into a new administration building down the hill, the Preston Castle was left to deteriorate due to weather, vandalism, and general neglect. 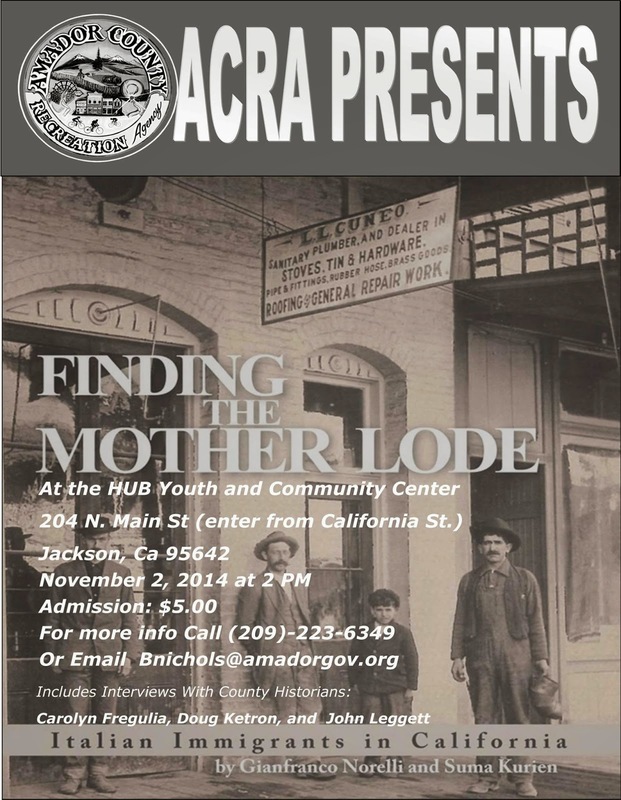 It now serves as a vacant, but vitally important landmark for Ione, Amador County, and the Mother Lode. It is a California State Historic Landmark and is on the National Register of Historic Places. Originally incorporated as the Historic Preston Restoration Foundation in 1996, and renamed in 1999, the Preston Castle Foundation (PCF) is a California 501 (c) (3) Nonprofit Public Benefit Corporation. In 2002, the Foundation was successful in obtaining a 55 year lease from the State of California for the purpose of preserving, rehabilitating, and utilizing the historic Preston Castle site. To help raise money for this important project, the Foundation has been sponsoring numerous fund raising events, historical tours, paranormal tours, event rentals, and soliciting memberships, grants, and donations. Funds raised enabled much needed improvements to be accomplished, including a new roof, a new 4th floor, refurbished front porch, rebuilt windows, safety upgrades, and many items relating to structural stabilization. Completing these projects satisfied key terms of the lease that would allow transferring ownership from the State to the PCF. This prompted, in 2011, the Preston Castle Foundation Board of Directors, under the leadership of Carol Lipchik, Director, to begin their Quest for the Deed. Carol and her committee put together a large binder with Business Plans, Budgets, Strategic Planning, a Core Historic Structures Report and the Vision and Mission of the PCF. This book was used at a meeting with the landlord, the Department of General Services of the State of California, to officially ask for transfer of the deed to the Preston Castle property. Carol and the PCF also began the difficult task of satisfying the State of California with answers to their questions on access issues and the feasibility of providing utilities separate from the State’s surrounding property. This project could not have been completed without the expert help of several consultants. Mr. Rob Aragon of Aragon Solutions helped answer utility questions. Mr. Jay Radke with Nolte Engineering provided maps and plans and overlays for many presentations to State officials. Mr. Matt Toma of Toma & Associates provided legal descriptions and boundary adjustments to the finalized 12.91 acre site. Mr. Jim Rooney, County Assessor provided a valuation of the property for escrow purposes. Mr. Malcolm White of Malcolm White Consulting helped with PG&E engineering leading to completion of dedicated electrical service. Mrs. Renee Chapman-Mikkelsen helped with the writing and editing. Mr. Mike Garavaglia of Garavaglia Architecture, worked with the PCF Board on Vision, Planning, the Core Historic Structures Report and National Significance reports for National Historic recognition. 2014 was a challenging year for the Preston Castle Foundation’s fundraising efforts, as several events and most of our tours had to be cancelled or significantly reduced due to restrictions from the California State Fire Marshal’s office. With the Deed in hand, we can once again open the majestic Preston Castle to the public. We are already working on our plans and schedules for 2015 and invite everyone to come visit, join the Preston Castle Foundation, make a donation, and/or volunteer to help. With the help of Elaine Lackey at the Amador County Records, Ms. O’Neill determined that Z.K. was Zadie Kephart and B.K. was Birdie Kephart, two teenage sisters from Plymouth, California. Ms. O’Neill was hooked and continued her investigation on the creators of her quilt. An 1896 a news article from the Amador Dispatch described the New Year’s Eve Masquerade ball that Zadie attended, wearing a chrysanthemum constume. Ms. O’Neill continues to search out stories of Zadie and Birdie, giving more background to her marvelous historic quilt. As a non-profit organization, MLQG is very active in Amador County. Comfort quilts are made by guild members and include baby quilts, cradle quilts, pillow cases, and special quilts for seniors. These quilts are made from scrap fabric donated to the guild. The funds raised by the Golden Threads Quilt Show are used to support local charities, such as Foster Family Services, Half Way Ranch, Amador Humane Society, Amador Pregnancy Help Center, Amador STARS, Interfaith Food Bank, Sutter Amador Hospital, and Operation Care. 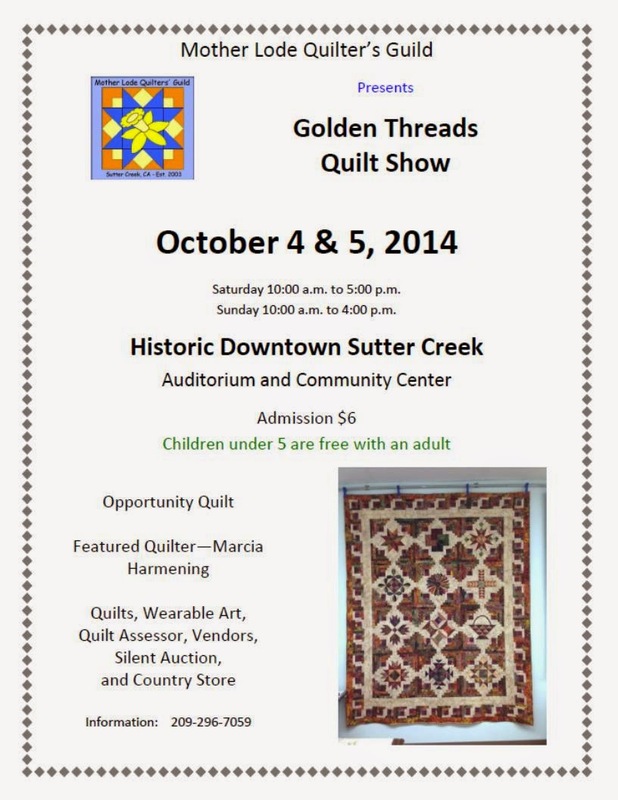 The Golden Threads Quilt Show will take place in Historic downtown Sutter Creek October 4-5, 2014. The show hours are Saturday, October 4, 2014 10:00-5:00 and Sunday, October 5, 2014 10:00-5:00. (Jackson, CA) Motorists on Hwy 49 in northern Amador County should allow extra time for their morning commute on Friday, September 26. The fifteen horse-drawn covered wagons of the Kit Carson Mountain Man Wagon Train will be traveling on Hwy 49 from the Plymouth Fairgrounds to the Old Highway 49 turnoff to Amador City, between 8 – 10 am. The horses travel between two and three miles per hour. Vehicle traffic will be allowed to pass the wagon train where there are passing lanes on the highway. Friday’s trip will be the second leg of a three-day journey for the Wagon Train that will start at Cooper Vineyards in the Shenandoah Valley, through Drytown, Amador City and Sutter Creek, and on to Jackson to celebrate Amador County’s 160th anniversary with a parade at 11 am on Sunday, Sept 28. For a full schedule of the Wagon Train route, go to www.VisitJacksonCA.com. 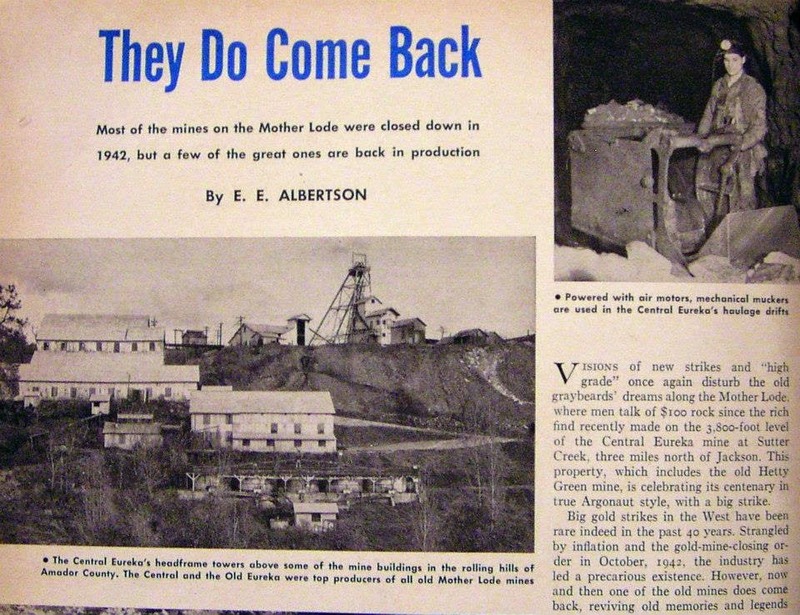 Most of the ore at the Central Eureka Mine in its later years came from the Old Eureka property. 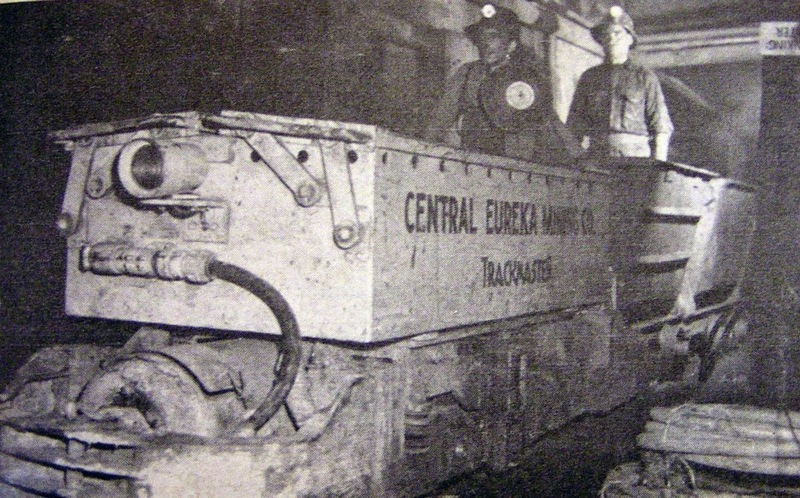 The ore was mined and then trammed to the Central Eureka shaft, where it was hoisted and processed through the Central Eureka Mill. 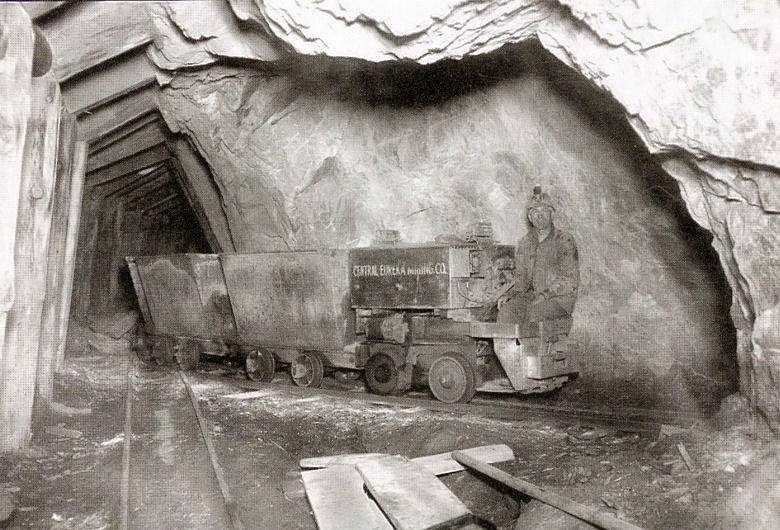 Early on the haulage tunnel was at the 1200 foot level and then later at the 3500 foot level. 15-20 Covered Wagons are coming to Sutter Creek and Amador County September 25-28th! Come and join the excitement as we celebrate the Diamond Jubilee of the California Legislature creating Amador County in 1854 and the beginning of the Gold Rush Days! 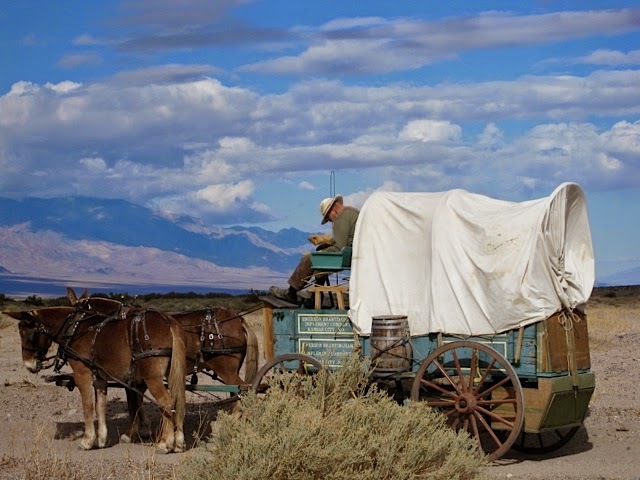 Step back in time and witness over 15 actual covered wagons, accompanied by mounted horseback riders, as they make their way down the historic Highway 49, the original 49’r Gold Rush Trail. The wonderfully preserved historic Gold Rush towns of Amador County will make for a perfect backdrop for this Wagon Train. Lots of fun is planned along the way during this 4 day event, so come on up and spend the whole weekend! Experience what it might have been like to be a settler in a covered wagon adventuring west. “The Days of ‘49” celebration will be held September 25 through 28, 2014. It will include a four-day wagon train traveling from the Shenandoah Valley to Jackson, Ca. The plan for the wagon train is to depict an authentic look back in time at the first arrival of settlers and miners to the Amador County region. Don’t miss this wonderful event. Day 1 of the wagon train will begin at Cooper Vineyards, with the first night spent at the Amador County Fairgrounds, in Plymouth. Everyone is invited to come to the Fairgrounds to get a free close up look at the wagons and possibly enjoy some “Grub” with the pioneers. Day 2 the wagon train will travel through Dry Town and Amador City to reach Sutter Creek and stop for lunch on Main Street for a few hours of entertainment there. The second night’s encampment will be at the Oneto brothers’ Slaughter House Ranch, on Ridge Road. The public is invited to come and view the wagons there too. Day 3 the wagon train will travel from the Oneto Ranch to Jackson Gate Road and on to the city of Jackson, where they will encamp at the back side of the Kennedy Mine at the Amphitheater. 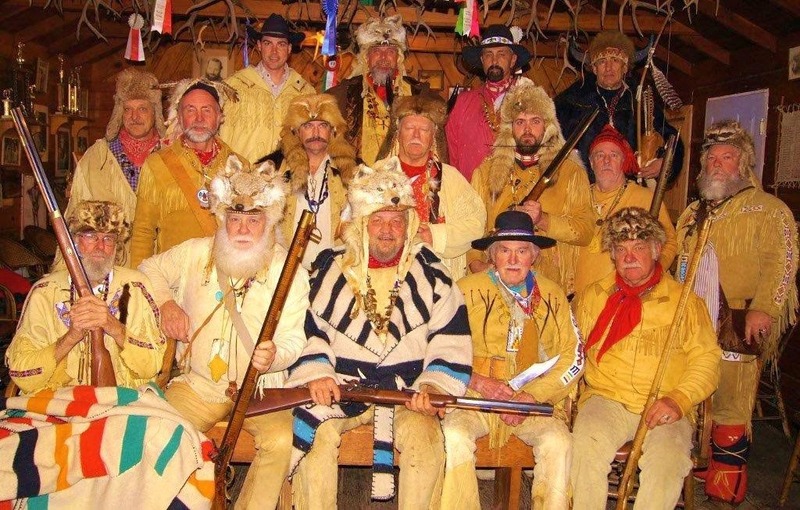 The public is invited to come to the encampment for a free viewing of the wagons and entertainment by the Mountain Men in the Kennedy Mine Amphitheatre. Day 4 in the morning attend “Cowboy Church” in the historic and tiny chapel at the Kennedy Mine Amphitheater. Then the wagon train will participate as the lead entry in “The Days of ‘49” parade, in Jackson. It is anticipated that nearly 20 covered wagons and approximately 150 men and women on horseback will participate. In addition to the parade, Main Street will be closed on Sunday to accommodate food concessions and several interpretive historic displays, such as gold panning, melodrama acts, collection of horse-drawn wagons, a costume contest and, possibly, a fast-draw competition. “Days of 49” Wagon Train Chairman is John Queirolo who, in the past, has coordinated such events as Queen Elizabeth’s visit to Sutter’s Fort in 1982 and horse drawn wagons and living history groups for the 1999 2nd Great Gold Rush in Old Sacramento. As chairman of the 1981 Highway 50 Wagon Train John rebuilt the caravan from 6 wagons in 1979 to 34 wagons in 1981. Ron Scofield is the Wagon Master for the event. In 1976 he took his family on a 6 month journey (in a covered wagon) across the United States in the Bicentennial Wagon Train from Southern California to Valley Forge and is a resident of Fiddletown. 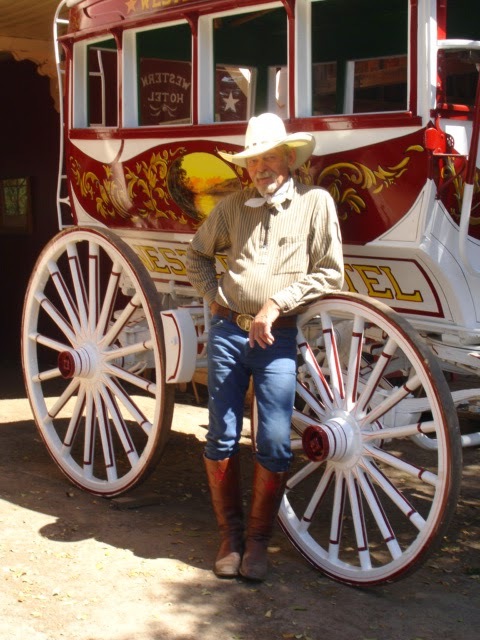 Ron owns The Red Mule Ranch which hosts the “Scofield’s Cowboy Campfire” on Saturday evenings, amidst a complete gold rush town that he built on his property in the Sierra Foothills, where he builds authentic stage coaches and wagons. The discovery of gold nuggets in the Sacramento Valley in early 1848 sparked the Gold Rush, one of the most significant events to shape American history during the first half of the 19th century. As news spread of the discovery, thousands of prospective gold miners traveled by sea or over land to San Francisco and the surrounding area; by the end of 1849, the non-native population of the California territory was some 100,000 (compared with the pre-1848 figure of less than 1,000). A total of $2 billion worth of precious metal was extracted from the area during the Gold Rush, which peaked in 1852. Join the celebration of Amador County’s 160th anniversary, also known as the Centennial Diamond Jubilee,September 25th -28th. Get a glimpse of what it was like to cross America in a covered wagon in search of riches in the Gold Rush of California. Be a part of history. All inquiries regarding the Wagon Train should be addressed to John Queirolo who can be reached at (916) 965-1136. You can also contact the Sutter Creek Visitor Center for additional information: 209-267-1344. 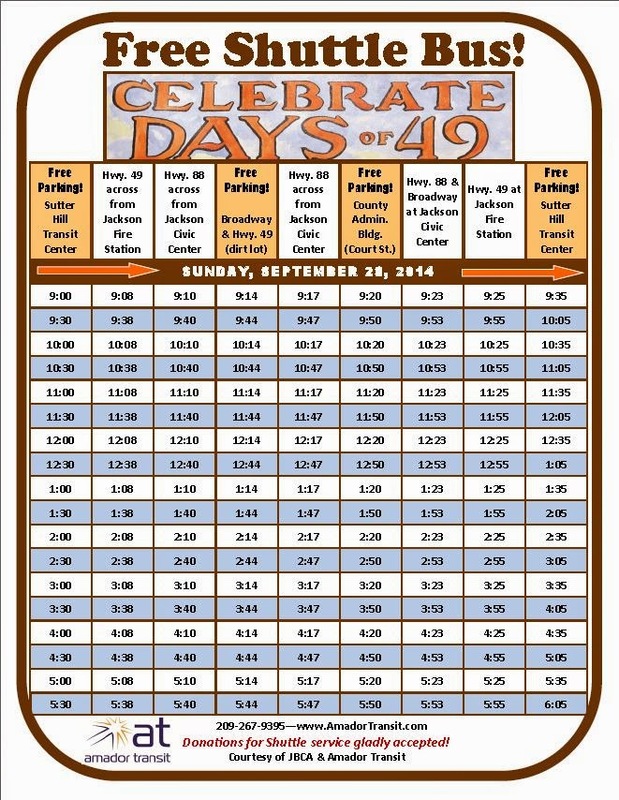 Amador Transit is providing a free shuttle bus from three parking locations on Sunday, September 28th for the Days of 49 Celebration. Avoid the hassle of parking downtown and ride the shuttle bus for free. (Donations though are gladly accepted!) Shuttles run every 30 minutes from 9am to 5:30pm. If you are coming from Ione or Plymouth directions or from Sutter Creek, park at the Sutter Hill Transit Center at 115 Valley View Way, Sutter Creek. 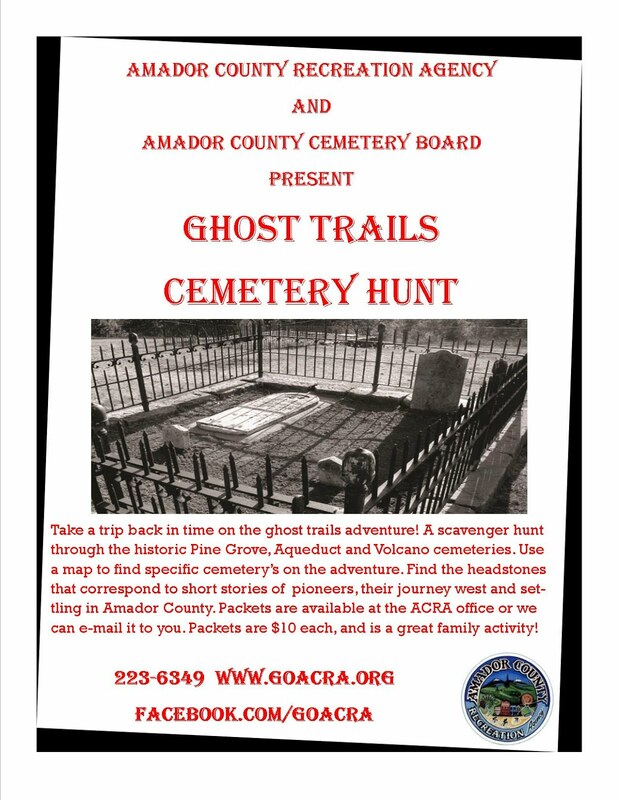 If you are heading down from Upcountry, park at the Amador County Administration Building (old hospital site) on Court St. in Jackson. If you are travelling from So. Jackson or Calaveras park at the dirt lot on Broadway just off Hwy. 49.